Pet Silk contains natural silk fibers as a major compound in every formula. Silk fibers are extremely beneficial when it comes to ultimate pet care. Our hair care products will give your pet a shiny, silky, smooth coat with a brilliant look. With the help of Pet Silk, pets have won awards all over the world for their beautiful coats. Our professional formulas containing silk, vitamins, and herbs produce mild shampoos, conditioners, and moisturizers. Our products provide a balanced hair treatment to help moisturize the skin and preserve the natural shine and volume of your dog or cats coat. Why Should I Use Silk? Hair care products containing natural silk will greatly improve the volume, shine, and manageability of hair. Natural organic silk consists of 17 amino acids that are identical to the amino acids in hair. This allows the amino acid composition to penetrate the hair and permanently reconstruct it from the inside out. Silk links hair fibers to strengthen, improve resiliency, and restore moisture balance. Liquid Silk Serum is the ultimate finishing product—a naturally rich serum enhanced with silk amino acids, vitamin E and panthenol to ensure the shiniest and softest coat. 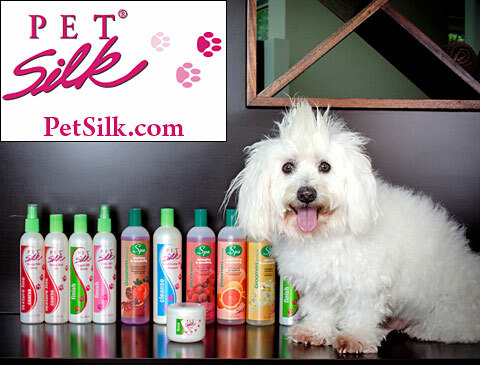 It’s the number one selling Pet Silk product, and is used by pet professionals all over the globe. A small nickel-size amount massaged into wet or dry hair will instantly detangle and deep condition. Continue to add nickel-sized amounts until the coat is rich, silky, and smooth. The Pet Silk Moisturizing Shampoo is silk-infused formula that is safe for daily use. A rich combination of amino acids and essential vitamins gently moisturize and cleanse the coat without leaving the buildup of residues that irritate the skin. Pet Silk Moisturizing Conditioner locks in moisture for a shiny healthy-looking coat. Specifically enhanced with extra silk Vitamin E and humectants, this conditioner deeply moisturizes to protects skin from dryness. A gentle professional formula with herbs and silk to condition, moisturize, and shine. The luxury your pet deserves in order to feel fresh and smell good! Sometimes our furry kids need a little sprucing up in between bath times. Our Pet Silk Colognes are perfect for maintaining that fresh scent on your pet without any hassle. Choose from 9 long-lasting fragrances that add extra freshness while reducing static. Perfect for dirty dogs with white and light colored coats. Pet Silk Bright White Shampoo is a whitening and color enhancing shampoo that works to remove dirt and oil accumulation and difficult stains without harsh chemicals. Infused with natural silk fibers to revitalize the coat and leave it silky smooth. Refresh the dullest coats without stripping skin and coat of vital moisture. A specially formulated itch relief shampoo to address needs of our beloved pets with dry, itchy and sensitive skin. The silk and oat extracts create a gentle, yet thorough cleansing formula that deeply moisturizes and soothes itchy and irritated skin. The coolest dogs use the coolest hair care. Our all-purpose line moisturizes the coat, nourishes the skin and leaves a long-lasting, cool, kiwi scent. With botanical essences and rich silk fibers, Pet Silk Cool Dog products restore healthy balance to dry or problematic skin, leaving your dog’s coat nourished, soft and lustrous. Your four-legged family member will feel great, look beautiful , and smell terrific, too! Order Petsilk Products For Your Dog Today! Petsilk can make a real difference to your dog's coat and skin. Healthy coat and skin make your dog happier, more comfortable and definitely more beautiful! Make sure to ask your groomer if THEY are using "Petsilk"! For more information about Petsilk products and to place your order, please visit our website today!